George Graham Reviews Lisa Lauren's "What Comes Around"
The contemporary music world is dominated by singer-songwriters. Somehow one is not considered a complete artist if one just performs other people's music, especially well-known songs. On the other hand, in the jazz world, the performance is the key element, with the composition being only the starting point for improvisation that often shows as musical creativity as the composition itself. And throughout the rock era, there have been a few significant "interpreters" of songs, who though they do some writing, have made a reputation on their own distinctive performances of existing material. Durable song interpreters range from Judy Collins and Joan Baez in the folk world to Joe Cocker, Bonnie Raitt and Rod Stewart in the rock realm. This week we have a fine record by an artist who is primarily a song interpreter, though she also includes three first-rate original songs. Her name is Lisa Lauren and her debut release is entitled What Comes Around. Ms. Lauren comes from a background in that genre where performance is key: jazz. The Evanston, Illinois, singer and pianist performs regularly in Chicago jazz clubs, and she draws on musicians who have a jazz background. But stylistically, the album is more in the laid-back but eclectic mold typical of singer-songwriters. And while she does include original material, she boldly plunges into very familiar territory for most of her record: The Beatles. Six of the album's dozen songs are from the pens of Lennon and McCartney. It seems a bit audacious to stake so much of one's album on songs that have each been recorded hundreds of times by others. What more could possibly be added to such chestnuts? The answer again comes from jazz. Just as hundreds of jazz versions of Stella by Starlight or Green Dolphin Street have been recorded over the years, with such interpretations still capable of sounding fresh, Ms. Lauren draws on her considerable musicianship and imagination, and along with the abilities of her fellow players, to come up with treatments that if not exactly providing startling revelations about the songs, nevertheless are so tastefully performed that they really do cast a new light on these cannons of the Baby Boom generation. Other non-original material also comes from similar ground: a song from Donovan, one by Gerry Goffin and Carole King, and the old Classics Four piece which has become a Muzak standard, Spooky. Of the original songs, the most memorable is one in which Ms. Lauren addresses the subject of being in the generation that grew up on the Sixties anthems that comprise most of the rest of the CD. In sound, Ms. Lauren resembles the singer-songwriters of her generation, with hints of Carole King, Rickie Lee Jones and some of the sultry inflections of Bonnie Raitt, with just a hint of the world-weariness one might expect in a jazz singer. While Ms. Lauren's instrument is piano, many of the arrangements on the album revolve around guitar, mostly acoustic guitar. There are guest appearance by some notable jazz musicians, including David Sanborn on one track, and acoustic guitarist Fareed Haque on five. Other regulars among the album's varying personnel are acoustic bassist Jim Cox and drummer Phil Gratteau. Ms. Lauren self-produced What Comes Around and presumably came up with its classy arrangements. 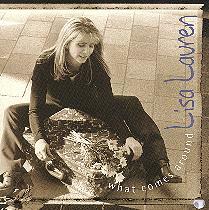 While pianist and vocalist Lisa Lauren is capable of writing some fine original songs, on her debut album What Comes Around she assumes mostly the role of song interpreter, reflecting perhaps her jazz background. But instead of singing jazz standards she tackles some of the most often recorded songs of the rock era. This is a somewhat audacious move, since it invites comparisons with dozens of other versions of the same songs, by everyone from lounge acts to innovative artists. Indeed, the song list, fully half of whch are Beatles compositions, carries with it the implication of a lounge or tribute act. But Lisa Lauren for the most part deftly escapes those stereotypes with fresh-sounding interpretations anchored by first-rate musicianship and tasteful creativity in arranging. And of course, her appealing vocals serve as the focus. In terms of production and sound, the album is also a class act. The recording and mix engineer was Scott Steinman, who is given credit for "additional production." The sonic clarity is excellent, with the possible exception of the acoustic bass which sometimes sounds a bit thin, but overall, the album is a treat on a good sound system. It achieves a nice balance between studio sheen and maintaining the warm sound of the acoustic instrumentation. Lisa Lauren offers no apologies for being a Baby Boomer. She provides updated and creative versions of songs she grew up with, along with some thoughts on her generation. It's an album that several generations should find enchanting.